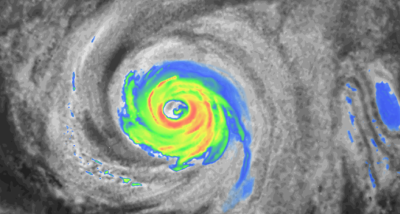 What happens to hurricanes when they leave the tropics? 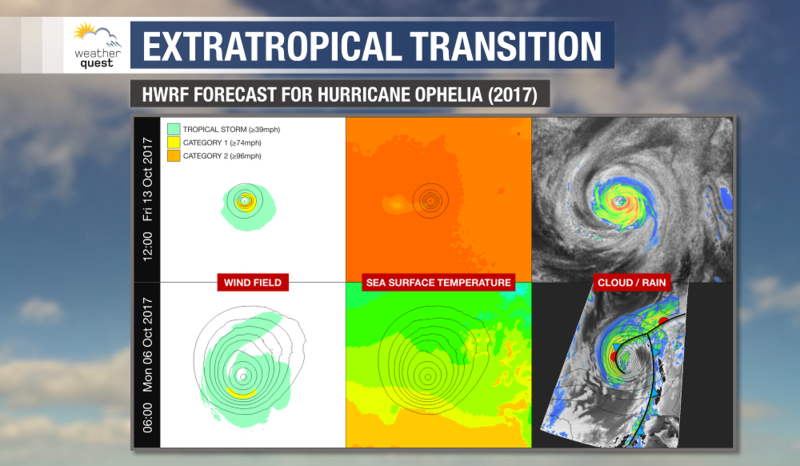 Tropical cyclones, including hurricanes, are compact, warm core systems that thrive in environments with light winds in the upper atmosphere and warm seas of at least 26C - conditions often found in the tropics, hence their name. Rains are generated from bands of deep convection, or thunderstorms, rotating around a tight central point - the eye. The strongest winds in hurricanes are found in narrow bands around the eye wall, and drop markedly as you move away from the centre. However, when such a storm wanders out of the tropics, it begins to go through a process known as extratropical transition. This fancy term basically means the once-tropical cyclone begins to lose its tropical characteristics as it moves over increasingly colder waters, and also encounters stronger winds in the upper atmosphere. This transition is very much dependent on how a given ex-tropical cyclone interacts with other bigger systems nearby - sometimes they are simply absorbed into larger low pressure systems, providing a bit of added warm, moist air. However, on other occasions cold air begins to get wrapped into the ex-tropical system, and because there is now a difference in airmass across the cyclone, frontal rain begins to develop and a warm / cold front are born. The wind field tends to expand also, from being very strong and compact in a hurricane, to something much larger but less-intense. The strongest winds are usually found away from the low's centre. Depending on the phasing between this low and the jet stream, this can sometimes lead to fairly intense windstorms in parts of western Europe, including the United Kingdom, should the remnant low be steered in that direction - perhaps even accompanied briefly by a sting jet. 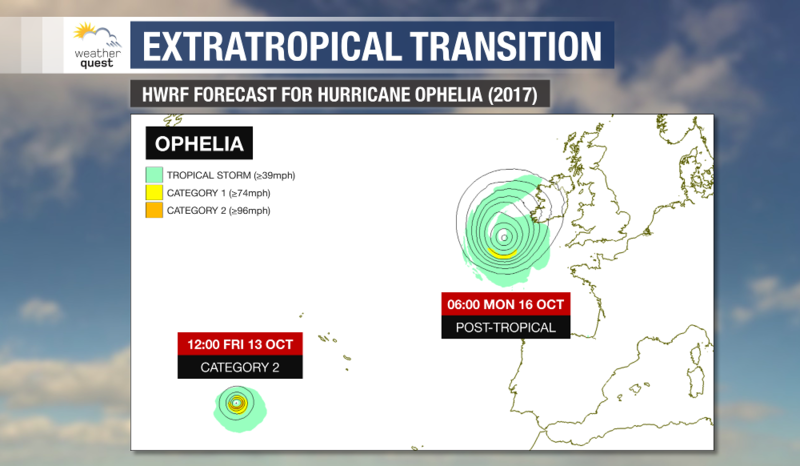 The image set above depicts Hurricane Ophelia as a Category 2 hurricane versus a power extratropical cyclone 3 days later. Notice the cyclone is much larger in size after extratropical transition, with a bigger (but less-intense) winfield displaced from the low centre. Sea temperatures are also notably colder - spot the upwelling caused by the Hurricane to the southwest of the system during its Category 2 stage. And finally, the difference in structure of the system - tight and compact as a hurricane, but bearing obvious frontal structures in its post-tropical stage. What causes wildfires in California? Weatherquest's New Home is "Best of the Best"
Has this winter been exceptionally windy?